Packers quarterback Aaron Rodgers will miss his seventh consecutive start on Sunday with a fractured left collarbone. GREEN BAY, Wis. — Aaron Rodgers will miss his seventh consecutive start with a fractured left collarbone, officially being ruled out of the Green Bay Packers’ must-win game Sunday against Pittsburgh. And if there’s any question as to why the Packers decided to continue on without their former NFL MVP quarterback, coach Mike McCarthy made it abundantly clear. "As an organization, we feel that we are not ready for him to play," McCarthy said Friday. McCarthy was asked 11 subsequent questions about Rodgers, and there was an obvious theme throughout. "As an organization, we don’t feel that this is the right time for him to play," McCarthy said in his second response after stating that Rodgers has not yet been medically cleared. "Obviously this is an organizational decision," McCarthy said at the conclusion of the third Rodgers-related question. "The conversation involved, and this is the decision. So this is where we are. "So, as an organization, we are not ready for him to play," McCarthy said at the end of his fourth answer. McCarthy was then asked who it is that makes the final call on Rodgers’ status. Is it general manager Ted Thompson? Is it team physician Dr. Pat McKenzie? Is it McCarthy himself? Is it Rodgers? That’s when McCarthy raised his voice. "As an organization, we are not ready for Aaron to play. OK?" McCarthy replied. In total, McCarthy used a variation of the word "organization" nine times in a press conference that lasted less than six minutes. A day earlier, McCarthy stood at the podium and declared that Rodgers was "ready to play" and "looks like he’s ready to play." No, that didn’t mean anything had changed with Rodgers’ medical diagnosis. But, after watching Rodgers fire passes in practice, McCarthy, as the head coach whose job it is to win games in the here and now, certainly made his opinion known based on what he saw from his starting quarterback. Twenty-four hours later, McCarthy had changed his tune a bit. "Absolutely," McCarthy said in response to whether he concurred with the decision to keep Rodgers held out. Rodgers’ frustration on Thursday was evident. Speaking with reporters at his locker for a brief, less-than-three-minute interview, Rodgers deflected three questions back to McCarthy. "That’s a Mike McCarthy question," Rodgers said in some variation three times Thursday. Rodgers sure didn’t sound like a player who thought he’d be on the field a few days later. 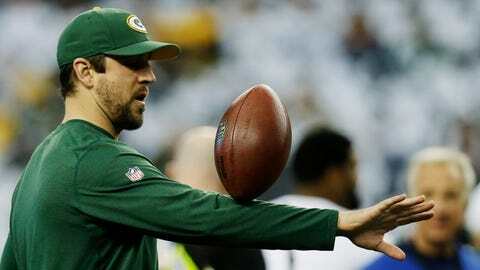 "I have a good sense of what’s going to happen, yes," Rodgers said Thursday. Considering that Matt Flynn had been taking the starter’s reps in practice again throughout this week, Rodgers seemed to know he’d be ruled out. But he wasn’t going to say it. "It’s a medical decision; it’s an organizational decision," Rodgers said. Notice a trend in the buzzwords being used? "Just as I’ve stated all along, we’ve got two different circumstances here," McCarthy said. "We’ve got Aaron Rodgers’ health, and obviously where we are as a football team. Until we feel good about where Aaron is medically, that will not be part of the second circumstance." The outcry from the Packers fan base has been impossible to miss. With few definitive answers offered by McCarthy and Rodgers, the number of frustrated fans seems to grow daily. One aspect of this decision should be clear, though: This is not because Rodgers doesn’t want to play. "He understands where we are," McCarthy said of Rodgers. "I mean, everything’s been explained, but he obviously wants to play. The kid’s played with injuries, he’s a tough guy, and like I said, he’s done everything he could possibly do to get back on the field." With a 7-6-1 record, Green Bay trails the Chicago Bears (8-6) for the division lead. The 7-7 Detroit Lions are right behind both teams. For the Packers, making it to the playoffs is simple math. If they beat the Steelers on Sunday at Lambeau Field and defeat the Bears in Chicago in Week 17, Green Bay will be NFC North champions for the third consecutive year. However, if the Packers lose to Pittsburgh this weekend and the Bears win in Philadelphia, Green Bay will be eliminated from postseason contention. So, with the Packers’ season on the line, it will be Flynn starting behind center for the fourth straight game. "We feel that we can beat Pittsburgh with our football team," McCarthy said. "That’s why we prepared. We came in here Monday morning preparing to beat Pittsburgh with Matt Flynn as the quarterback."